Thai Massage and Sports injuries by Adriana Pop at Chelsea Natural Health. 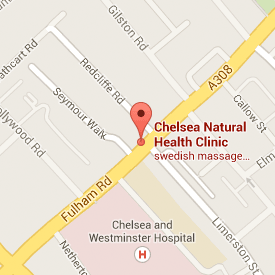 Thai Massage and Sports injuries by Adriana Pop at Chelsea Natural Health Clinic, Fulham Rd., SW10. Most sports injuries involve damage to muscle fibres, myofascia or tendons and they are commonly caused by overuse of muscles that are not functionally balanced with other muscles in their group and with their antagonists. Thai massage therapy enables every individual muscle to assume its normal relaxed length when not contracting. When injury does occur the controlled stretches and manipulations in Thai massage have an unrivalled ability to speed healing and restore pain-free function. Thai Massage provides maintenance that muscles need, improving performance by reducing the risk of injury for athletes and dancers during their training. Regardless of whether you receive a Thai Yoga Massage for healing or relaxation purposes, releasing tension helps bring well-being and vitality to the body. In Thai Yoga Massage, the gentle stretching movements, energy line and pressure point work produces a uniquely relaxing yet energising and highly effective therapeutic treatment, ideal for anyone regardless of their level of flexibility.